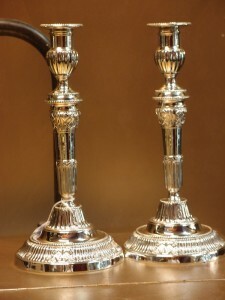 Home » Blog » “Silver” Candlesticks, aristocratic deception and insider trading. Victims of the dot com crash (2001) and the GFC (2007-10) might have been more cautious had they studied the Tulip crash (1637), the South Sea Bubble (1720) the Mississippi Company Crash (1720) the Crash of ’29 or the twenty or so other major financial crises since Tulipmania. In each of these cases the multitudes were ruined and the few were made immensely rich. One of the odd but instructive results of the Mississippi Company was the Paris technological revolution of the 1730s. Those who cashed in their shares at the peak of the bubble amassed immense fortunes. They included commoners as well as nobility. Insider trading was rampant, by the way. This new patronage by rich commoners placed different demands on architects and designers than traditional aristocratic requirements. This led to vigorous competition between patrons and artists for the very latest in housing and technology, as a result of which great developments in plumbing, air conditioning and heating were accomplished. The Paris rich were much more likely to have a water closet (plumbed flush toilet) in 1730 than in 1830. Technological advances are not always permanent. The same clients demanded cutting edge design in furnishings and interior decoration. One could hardly be seen with last season’s furniture in the salon. In an age before home theatres and giant televisions, the principle prestige homeware in the 18th century was silver for the rich, and textiles for the middle classes. A well-to-do merchant’s housewife would ensure the maid would carry in fresh bundles of embroidered linens to the amoire lavishly stocked with textiles if her friends were present to show wealth. Textiles were enormously expensive before machine weaving arrived about 1840. While bourgeois wealth was hard to fake, the aristocracy could resort to effective sculduggery. The rich would have a fabulous display of immensely valuable silver candlesticks, plates and ewers, cutlery and even chandeliers. 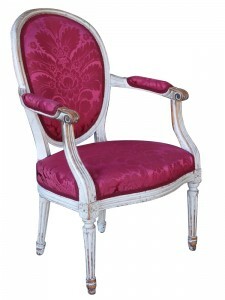 Royalty would even have furniture entirely encased is sheets of finely worked silver. A few sets remain. However, the desire to impress is not always equaled by the financial wherewithal, even in aristocratic circles. Hence imitation silver was an important way of looking richer than you were. These days we have electroplating, since the 1840s, to make inexpensive EPNS (Electro Plated Nickel Silver). Since electricity was not readily available in the 18th century other methods were employed. Many collectors will be familiar with Old Sheffield Plate, invented by Thomas Boulsover in 1743. This technique allowed a sheet of sterling silver to be attached to a sheet of copper and an object could then, with great difficulty and skill, be made form the silver veneered copper sheet. Convincing imitation silver candlesticks, trays and tea services could be made, and appear to be the much more expensive solid silver. Prior to this it was possible to silver coat brass, using the same technique that persisted for many years in the manufacturing of silvered brass clock dials. Any metal rich in copper can be silvered this way. It involves coating the article with a mixture that includes cyanide of patassium, nitrate of silver, salt, and water. This silvering was not very durable, and very little brass remains with even a whiff of original silvering. Most has long since been worn completely away through use and cleaning. However, sometimes the protected underside of the vessel or candlestick will still show traces of the original silvering. Many collectors of brass are unaware that many grand brass items were originally thinly coated with silver or gold to economically but effectively inflate the owners’ prestige. Some of these now bare brass objects are engraved with the coat of arms of people of great rank, including Dukes. The silver has long since worn away, but these chandeliers, champagne buckets and similar would have been on display with the intent that guests would assume that the objects were immensely expensive solid silver. Enormous sparkly white stone earrings worn by Elizabeth Taylor would be assumed to be diamonds of great value: no one would think they were paste. The same psychology worked in favour of the aristocracy. An even cheaper way of imitating costly silver was to tin brass candlesticks, in the same way today’s copper chef’s saucepans are coated inside with tin, a shiny silver coloured metal. Looking at any supermarket tinned steel food can will give you an idea of the pleasing result. The coating of the copper-rich metal candlesticks, teapot or whatever, with pure tin, resulted in a much thicker and more durable silver coloured skin than silvering with the silver nitrate method. The vast fortunes made by the few clever traders in the share market booms of the early 18th century dazzled everyone. Modish houses with advanced technology, not forgetting the socially crucial flush toilets, were meant to impress. However, the vast majority of punters did very badly. This provides one explanation as to why the high aristocracy might need to resort to fakery with piles of plated silver. The real silver may have gone in the crash. Certainly the popularity of painted furniture in Paris after the crash of 1720 has been attributed to the poverty of much of the nobility. 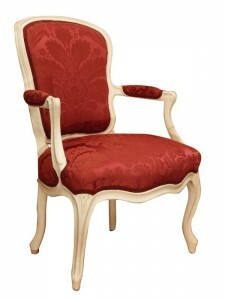 They simply could not afford to gild their chairs anymore, and paint still allowed them to be visible in candlelight. This was an important consideration when one had to navigate a candle lit room: one bumps into dark furniture. Even subjected to straightened circumstances the Parisian nobility may have had plated brass candlesticks and painted chairs, but they were of the most refined and exquisite beauty and craftsmanship. This makes them prime collectables today, for collectors for whom the real silver is out of reach. ← What is Steampunk and where can I see its influence?